The Living Peace Award is given to individuals or groups who live peace in their lives and thus inspire others. The Great Stupa of Dharmakaya is the symbol of this award. The first recipient of this award was His Holiness the Dalai Lama, Tendzin Gyatso, who in September 2006 visited the Great Stupa of Dharmakaya at Shambhala Mountain Center to bless it and receive the award, presented by Sakyong Mipham Rinpoche. 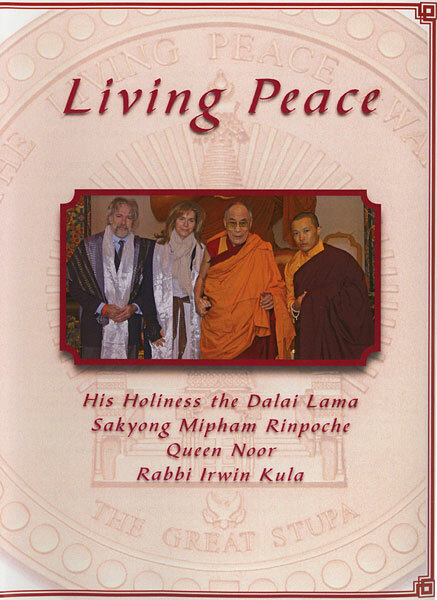 A full record of that historic occasion, this DVD includes remarks by His Holiness the Dalai Lama, Sakyong Mipham Rinpoche, Queen Noor, and Rabbi Irwin Kula, as well as ceremonial offerings by Chief Arvol Looking Horse and Lama Karma.